On 9/1/2012, the WTMRA landed at Old Rooster Diner, where Jackie mentions that she is one of the first recipients of the award. Jackie’s blog is “Change for a Better Me: a mix of recipes and stories to help make a healthy change easier.” (She switched to a gluten free diet because of health issues). Even though the WTRMA is the newish kid on the block, Google pulls up sixteen pages of references to it, thus reflecting the power of geometric progressions with blog awards. 1. Display the WTMRA logo on your webpage or sidebar. 3. Make these rules, or amended rules which keep to the spirit of the Wonderful Team Member Readership Award, known to each reader nominated. A while ago, I wrote this post about my most loyal readers. Now I nominate these same loyal readers for this WTMRA. Hey. When is someone going to start a “The Cat’s Meow Award” for blogs that detail our most wonderful qualities? Now that would be an award to value! Hi Janice, you are a perfect team player and I have enjoyed reading your blog since the first time I found it early on in the A to Z challenge 2013. You were one of the small group who inspired me to keep going through to Z even though I hardly knew how to use wordpress when I started on 1st April. We both have a keen interest in words (and using them correctly) and also share a love of cats; I was delighted to have the opportunity of passing on this award to you. Thanks for the award. That’s so sweet of you! Now I am about to leave on a two week trip, and don’t have time to put it up or nominate others. But I tell you, this is a big encouragement to me and I will make an effort to follow through when I get home. By the way, did you design the Awesome Cat Award? Congrats on the award, Janice 🙂 And thank you very much for the tag. Great post Janice! Congratulations on the award, and thank you so much for passing on the honor. I love that you researched the history of the award. I’ve often wondered from where and when these blog award have originated. And thank you for the nomination! I’m going to have to give some thought to answering what a good reader is. Thanks, Jackie, for this update. 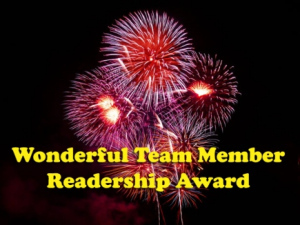 I think it is a good award because it encourages reading other blogs, and this award does not have a lot of “busywork” requirements that some of the other awards have. It is nice to get recognition, but when that recognition brings extra work, it is not always appreciated by the award receivers. We need to keep things simple in the blogging world. I think the readership award does that.